If you missed out on the Hidden Cash treasure hunt last May, never fear. 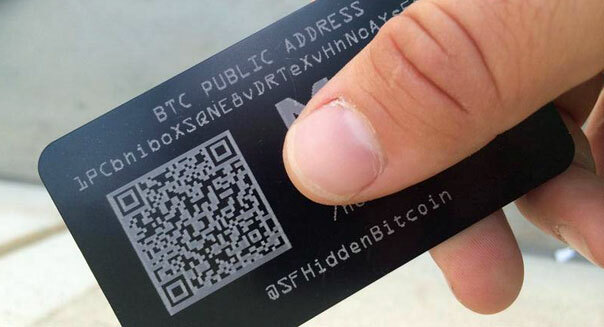 @SFHiddenBitcoin has arrived, transforming San Francisco into a gigantic bitcoins beta test. No one knows who is leaving the shiny bitcoin "wallets" around the city and posting tantalizing clues on Twitter (TWTR). But the buzz is building for the daily crypto-currency scavenger hunt. The wallets look like small sheets of aluminum with a QR code, a bitcoin address and the hunt's Twitter handle. Each wallet is reported to contain 0.0333 bitcoin, or about $20, which goes to those clever enough to figure out the clues. They can be discovered by following the hunt's Twitter account: @SFHiddenBitcoin. @SFHiddenBitcoin posts the slogan: "Bringing bitcoins to the people by hiding them. An educational experiment." The tweets claim there will be a new wallet in a new location (one's been spotted at Mark Zuckerberg's house) every day of July. Whoever's behind the hunt may need a new clue writer -- all of the cards have been located shortly after the clue was released. This lighthearted contest adds another milestone to the mainstreaming of bitcoin. Over the last weekend in June, California Gov. Jerry Brown signed into law a bill that legalizes bitcoins and other digital currencies for transactions in California. Given that California is the eighth-largest economy in the world, AB 129 is likely a game changer. %VIRTUAL-article-sponsoredlinks%Bitcoin's evolution of late has been rife with both potholes and possibilities. After a tenuous period during the collapse of Mt. Gox, government crackdowns, Silk Road bitcoin seizures and even rumored crypto-currency-related deaths, a significant upturn began this spring. E-commerce companies such as Overstock (OSTK), eBay (EBAY), Apple (AAPL), Google (GOOG), Expedia (EXPE) and Yahoo (YHOO) took steps to recognize Bitcoin as legit. Bitcoin accelerators are emerging via organizations such as 500Startups, which recently funded five startups. In April, the Massachusetts Institute of Technology announced the Bitcoin Project, an experiment that provides every undergraduate student on campus with $100 in bitcoins. The idea is to research how students use bitcoins when their whole community has them.